For safe chain sling use, our site offers recommendations to use chain slings in the proper way. 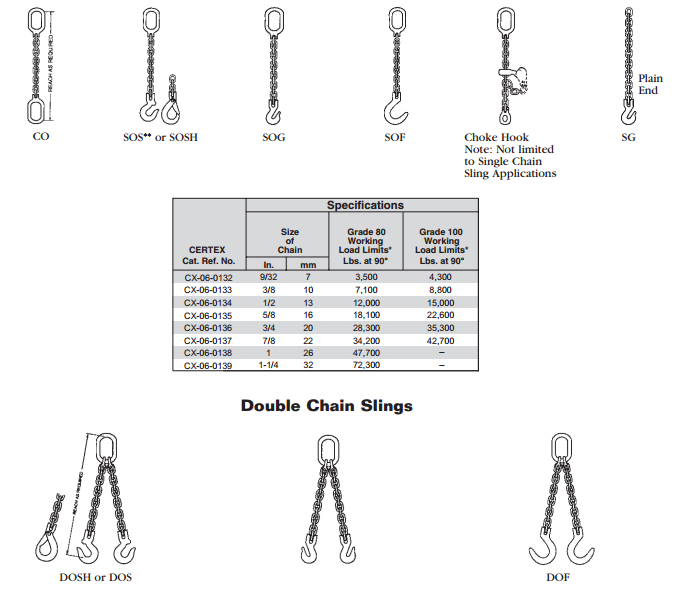 Download the specification PDF below, to receive information on recommended chain sling use, inspection, and types of chain slings. CERTEX carries a full line of quality single, double, triple and quadruple chain slings for all of your lifting needs. We also carry three point suspension, Steady-Lift magnet chains, and chain sling fittings. There are a few types of chain slings and our diagrams and tips tell you how to order the right chain slings for your job. Each chain sling is made for different weights and the type of job you are performing. CERTEX, USA also offer an exciting new family of alloy chain sling components. Instead of the old “one component does one job” fitting, GrabiQ combines in a single component up to three separate functions. 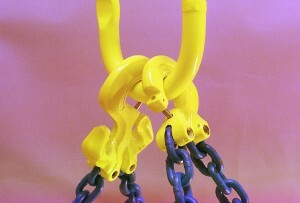 A GrabiQ Master Grab serves as the master link, connecting with two legs of chain, and the shortening hooks for each leg, all in one fitting. Using traditional fittings to construct the same sling would require 7 top-of-the-sling components, instead of just one. Some of the new GrabiQ fittings are equally well suited for use as top assembly connectors or hooks at the bottom of a sling, adding even more flexibility for riggers. Most of the time, GrabiQ slings will be lighter than their grade 80 counterparts. Fewer components means less weight. Also, because grade 100 has a lifting capacity that is usually 25% highter than its grade 80 counterpart, the ratio of strength-to-weight is greater, offering additional weight savings with GrabiQ.